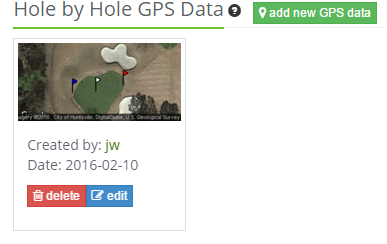 I just finished fixing the GPS Course Hole Data feature on the Course page. What in the world is that you ask? Well, eventually (hopefully before it gets warm this year) I’m going to create a phone app for this site. Part of that app will be a GPS where you can get distance to the hole and pretty much anything else you click on. The Front, Middle, and Back green locations for the GPS section of the app will come directly from user who enter it on the course page. Confused yet? Simply put, when you use the phone app and want to get a quick distance to the hole, it will only work if you (or someone else) has first entered the data on the course page of this site. Go to the course page of your favorite course. Under the scorecard, click the “add new GPS data”. Let me know if you have any questions or see some problems. Will the phone app be on both android and ios? Yes, that’s what I’m shooting for.